Chilean winter of discontent: are protests here to stay? The governance formula that characterized the Concertación governments and now the current centre-right administration was created to transition from the Pinochet regime rather than to allow for citizen participation in the policy-making process. The most important success of the current protests has been to trigger debates on long-neglected issues. Compared to the large-scale and often violent protests that have erupted in countries all over the world since the 2009 economic crisis, the demonstrations which have filled the streets of Santiago during the last three months have been relatively tame. ‘Only’ 240,000 people demonstrated in Chile yesterday, for example. But for a small country tucked away behind the Andes at the far corner of the globe, these are astonishing figures. To the external observer, these protests may be surprising as Chile is usually referred to as Latin America’s model of political stability and socioeconomic development. The country is not known as a hive of social discontent. Most importantly, Chile has not seen protests on this scale since the widespread demonstrations against the military dictatorship of General Augusto Pinochet during the 1980s. Students protest in Santiago de Chile. Marcos Gonzáles Valdés/Demotix. All rights reserved. The demonstrations have been well organised, peaceful and creative although isolated and regrettable incidents of violence (highlighted and dwelt upon by a right-wing media) have marred the public's perception of their overall image. Interestingly, the demonstrations have brought together different interest groups: for the first time since the re-establishment of democracy in 1990, secondary school students, university students, their parents, teachers unions, and workers have taken to the streets together. It is further important to note that the demands of the students have gone beyond education-related issues to include broader concerns for income distribution. Their latest proposal was presented as a project to “overcome the scandalous inequality gap present in Chile today”. To achieve this aim, the students have argued, it is no longer sufficient to improve the current system; it is necessary to replace it with a new one in which the state guarantees free public quality education. While the university student movement has constituted the most sustained protest, its demonstrations followed a month of protests by environmentalists against a five dam hydropower project in Patagonia (HydroAysén). They also appear to have sparked a chain reaction of smaller protests: miners have gone on strike, the citizens of the small town of Dichato, which was destroyed by the 2010 earthquake, have protested against the extremely slow process of reconstruction, and on a couple of occasions random users of the capital’s public transport system have paralysed the city’s traffic to protest against the long waits at the bus stops. During the first week of August, the prohibition of new demonstrations led to violent outbursts of protest across the country accompanied by the traditional clanging of pots and pans in the streets, which also characterised demonstrations during the dictatorship. Opinion polls show that most Chileans not only strongly agree with the demands of the movements, but also markedly disapprove of the way in which the Piñera administration has handled them. The President’s approval ratings have fallen to record lows, 26%, while the disapproval ratings have increased to almost 53% (CEP). More generally, the opinion polls show increasingly high levels of disapproval of all political coalitions: 53% for the Concertación and 59% for the Coalición por el Cambio, Piñera’s coalition, in the last Adimark survey. Although the recent protests have captured the headlines of the Chilean media, and also been highlighted in the international press, there has been little serious analysis of the underlying reasons for such an outbreak of unrest. Are we looking at an isolated period of incidents or is this the beginning of a broader cycle of protest? Are the consequences of Chile's lack of social cohesion and profound inequalities finally coming home to roost? Or are these demonstrations simply a manifestation of the fact that Chile is becoming a “normal” democracy? Beyond the explanations relating to the Piñera government’s unpopularity and inability to respond appropriately to the demands of the protesters, we argue that what we are witnessing in Chile is the result of two parallel processes: on the one hand, the protests express the rise of more critical citizens, and on the other hand, they show that social movements have reached significant levels of organization. This coincidence of demand and supply explains not only why the protests have been massive, but also strongly supported by the majority of the Chilean population. These new scenarios make it very likely that the protests of the last months are not an isolated phenomenon, but rather, something that will be a recurrent feature of the Chilean political landscape during coming years, unless the existing structures of political representation and the social distribution of economic gains change. As Pippa Norris has shown in her work (Critical Citizens: Global support for democratic government; Democratic deficit: Critical citizens revisited) the emergence of critical citizens is associated with a process of continuous economic growth and rising levels of education, which in turn lead to both increasing levels of support for democracy and the advent of new social aspirations. Critical citizens are those who support the democratic regime per se, but are discontent with the current functioning of its institutions, particularly of their representative capacity. This is exactly the trend that we can observe in Chile. As public opinion surveys such as the ‘Centro de Estudios Públicos’ (CEP) and the ‘Latin American Public Opinion Project’ (LAPOP) show, Chileans are not against democracy as a regime. In 2010, 78% declared that democracy is preferable to any other form of government (LAPOP). However, 89% of Chileans do not identify themselves with a political party (LAPOP). It is not surprising then that the students refuse to participate in a parliamentary dialogue platform to solve today’s stalemate, and argue instead that a plebiscite is the requisite institutional channel to decide the future nature of the education system. Interestingly, the expansion of primary and secondary education, macroeconomic stability and economic growth were some of the key successes of the Concertación governments during the last two decades. The success in these areas was achieved through a governance formula that was characterized by political consensus, informal agreements and processes of gradual reform born out of the institutional constraints imposed by the legacy of the military regime, which, for many years, obliged Concertación governments to compromise with an institutionalised right-wing congressional majority. Structural reforms that would have counteracted Chile’s high levels of inequality in all areas of socioeconomic development were therefore deemed impossible to achieve. Instead, increased fiscal resources were directed at funding a gradual expansion of social welfare policies to counteract the negative distributional effects of the neoliberal reforms the military regime undertook prior to 1990. Together, economic growth and social policies reduced poverty levels from just under 40% to 15% during the last 20 years, although Chile’s Gini coefficient (a measure of income distribution) remains amongst the highest in the world at 0.54. The problem behind the present-day citizen discontent is that the same conditions which ensured Chile’s socioeconomic success and political stability also explain the inability of politicians to improve Chile’s historically persistent inequality. The very path initiated by the Concertación governments, now adopted by the Piñera administration, has defined new challenges to which neither the right nor the left have been able to respond. If anything, the mobilizations of the last months have been a reminder of the fact that responses such as “no congressional majority”, “not politically feasible”, or, “insufficient resources” are not credible any more. The legitimizing discourses that accompanied the elite-led transition to democracy, defined the boundaries of democratization, and provided an appeasement mechanism for social demands for greater equality, have been exhausted. At the same time, the most negative effects of neoliberal reform are now evident. So, as the successes of the Concertación have not been accompanied by any significant reduction of inequality, cultural breaches have been unearthed. The clanging of pots in many middle class neighbourhoods over the last weeks show that an important part of the Chilean public is unwilling to excuse the lack of deeper reform and limited popular input as simply a necessary condition for maintaining the delicate power balance that characterized the transition. And although the government removed the Minister of Education and has presented several reform proposals, most Chileans agree with the students and consider these measures to be insufficient (La Tercera survey). But there are more reasons to believe that the recent protests are not a transitory phenomenon. Long dormant contradictions are being articulated by social movements with an increased capacity to convene people around their demands, and through this shape politics and define the policy agenda. The rise of critical citizens has thus been accompanied by new supply-side conditions, namely, more organized social movements that are able to voice the discontent. In light of the general decline of confidence in political parties and in political institutions, this discontent is channelled through popular disengagement in formal forms of political participation (such as voter registration levels), while simultaneously “informal” forms of participation, such as activism and mobilization, attract more people, appeal to the population in general, and secure broad levels of support in the opinion polls. The leadership of the student movement has been articulated and thoughtful. Furthermore, the student leaders have undertaken an exemplary process of grassroots democracy within their movement, organising regular conventions, democratic decision-making procedures, and large-scale fora, in which delegates from individual schools and universities could voice their opinions. Though the leader of the university student movement, Camila Vallejo, has attracted much of the public's attention through her remarkable charisma, she has almost always shared the limelight with other leaders of the movement, thus giving the impression that she is but one of many future political leaders who will emerge from this movement. As for the students’ demands, they have shifted focus from the quantity to the quality of education provision and access, and from specific material demands to claims on its structural character. As many analysts have pointed out, the system of higher education, driven by market forces that allow for profiteering from frequently loan-financed student fees, constitutes a mechanism of segregation through which rich, middle class and poor students are forced to attend different higher education institutions. Thus, as the students argue, the lack of structural reforms in the education system contributes to the existing high levels of inequality of the country. 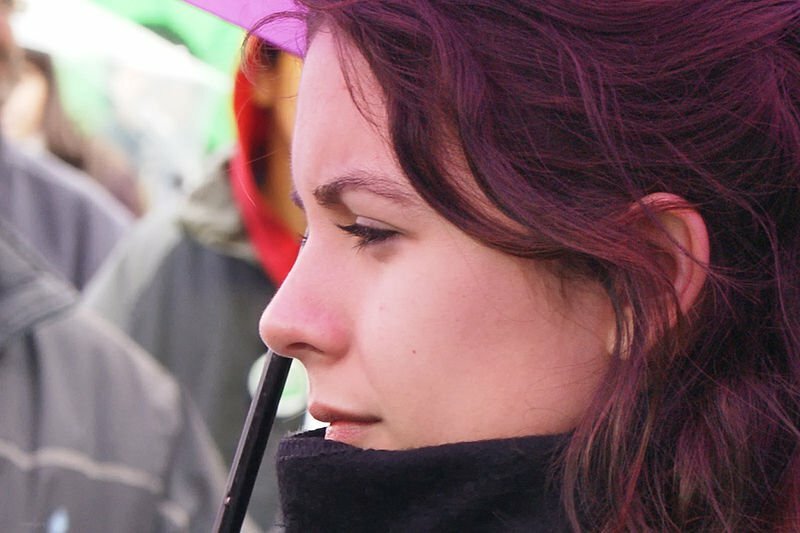 Camila Vallejo, leader of the students movement. Credit: Manuel Venegas/Wikicommons. 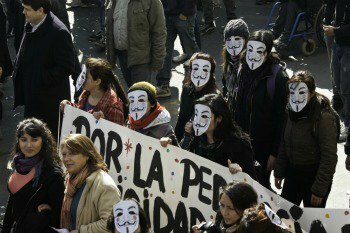 Only the future will demonstrate the efficiency and durability of social movements in Chile. Yet, just as in 2006 with the Pingüino movement and in 2007 with the subcontracted workers’ movement, we are once again witnessing how protests bring about a national debate and policy initiatives that were not on the government’s agenda. Although social movements are cyclical by nature, each mobilization leaves lessons and pending tasks. For example, the higher education reform that is currently being discussed was also on the agenda in 2006, when the Pingüino movement made education a top priority of the Bachelet government. However, higher education became a second priority as the secondary school students were more concerned with the abolition of the Constitutional Law of Education (LOCE). In light of the above, it is not too audacious to think that the tendency that we are observing may be an enduring one. To the extent in which social movements, both new and re-articulated ones, are able to connect with existing discontent and establish alliances with other formal and informal political actors, they will be able to shape future policy agendas. In this context, the deepening of democracy in Chile will depend on the capacity of institutional political actors to adapt the political system to reflect the emerging demands of the citizenry. Undoubtedly, the governance formula that characterized the Concertación governments and now the current centre-right administration was created to transition from the Pinochet regime rather than to allow for citizen participation in the policy-making process. Perhaps the most important success of the current protests has been that they have triggered debates on issues that have long been neglected by the political establishment, in particular tax reforms that redistribute income and constitutional reform that generates levels of representation commensurate with a modern democracy (rather than the current binominal system, which almost guarantees power parity between two coalitions that no longer seem to reflect the demands of voters). A failure to respond to the new demands raised by this winter of discontent in Chile could provide a fertile soil for the emergence of political leaders with a more populist bent, willing simply to throw more money at deeply rooted problems. That would be a shame.